Keeping your bored dog entertained while he or she is home alone can be a challenge. If your dog has the free reign of the house while you’re gone, mischief can take place while you’re gone. Often, it can be quite expensive and even dangerous if your pet assuages his boredom by shredding his bed, chewing a hole through a bathroom door or any one of a dozen scenarios you’ve seen illustrated on Facebook and YouTube. 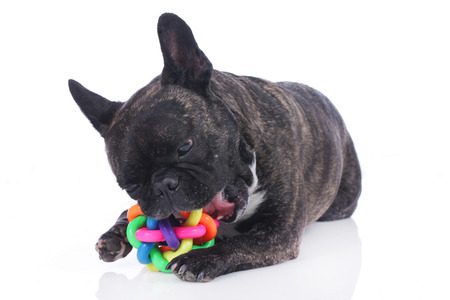 Fortunately, there are any number of ways to keep even an active dog occupied if you have the right toys and activities to keep your dog’s mind and body engaged. Our list is based on test runs with several bored dogs we know. In all cases, the toys had to entertain the dogs for more than 15 minutes at a time. They also had to be toys that the dogs went back to more than once during a period of time alone and that the dogs showed marked preference for from one day to another over a period of at least a week. Tricky treat ball dispenses a treat randomly to reward your dog. 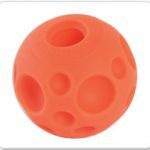 This bored dog toy looks at first glance like a simple ball, but it’s covered on the surface with an array of holes of various sizes and depths that make it easier for your pet to grab and toss it around. One of the holes in the Tricky Treat Ball will dispense a treat when the ball is dropped a certain way, keeping your pet guessing until he or she is rewarded with the treat. Since dogs love balls and this one is easier to grip, most dogs will continue to play with it, hoping another treat will dispense. This is a classic toy that wears well with age. It’s made of hard rubber, bounces around in crazy directions to keep a dog guessing and is easy to use. The hollow center can be filled with peanut butter or other treats, then frozen so that it takes a while to get all of the treat out of the toy. While peanut butter or Cheez Whiz are favorite fillings, if you have a best friend who is on a diet, you could fill it with almost anything, including berries and yogurt. If your dog tends to destroy toys, the Kong is a winner. The Shuffle bone toy will entertain a bored dog while you’re away. There are a several dozen kinds of dog puzzles that will engage any dog and keep him or her entertained for long stretches. The best have features such as shape puzzles to solve or hidden treats that a bored dog has to find in hidden parts of the puzzle. 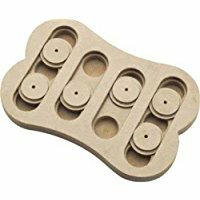 The Shuffle Bone puzzle has several sliding pieces that conceal small treats. Dogs have to figure out where the treats are, then how to get to them by sliding the various pieces. The best ones are made of hard plastic that you can easily clean as needed. This toy has it all if you’re looking for ways to entertain a small dog! It launches a mini tennis ball (Oh Joy!) across the room or the yard, then rewards your pet with treats for returning the ball and dropping it in the top of the iFetch. Any bored dog will love fetching, then getting rewarded. The repetitive activity will also hone your pet’s retrieval skills. While it’s more expensive than most toys, keep in mind that it runs on batteries and actually has an adjustable mechanism for launching the ball 10, 20 or 30 feet. This is best used outside or in a large room without a lot of breakables in it and is only for small dogs. Music can calm most dogs, and research has shown that instrumental music (no lyrics) is the most soothing. You can purchase a variety of recordings to play for your pet while you’re away. You can also download the “Relax My Dog” play list on Spotify. It has several hours of music combined with sounds like birds and flowing creek water. Also try making a recording of your own voice and the normal sounds of your household (conversation, the radio or television programs, appliances, etc.) that will keep your dog calm and comfortable while you’re away. This is a top-of-the-line, high-tech solution to the “my bog is bored” problem. It’s a two-way, Wifi video camera with a treat dispenser. 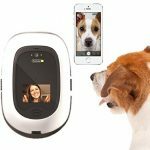 You can use the PetChatz to see and talk to your dog and let him or her see and hear you using any smart phone, computer or tablet. It includes a motion detector and you can give your pet treats using the remote treat dispenser. For the ultimate in luxury care while you’re away, the iFetch can even spray a puff of soothing aromatherapy at your command. As the saying goes “a tired dog, is a happy well behaved dog” I love the options you show for keeping out dog’s occupied and stimulated. Even when they are not alone, these puzzles and treat balls are great for keeping their minds active. Love the idea of iFetch! We have smeared peanut butter in the past in Kongs to help keep some of our hyper active foster dogs engaged! We’ve only just started leaving the dogs out of their crates while we’re not home. They are mostly happy to sleep or look out the windows at all the wildlife. When they are in their crates, I usually give them a kong full of treats. I do love the idea of the PetChatz to keep an eye on them too. So many great options to keep furry family members occupied! We have several of the toys you mentioned. The Tricky Treat Ball is an absolute favorite. The Kong filled with peanut butter is great entertainment during brushing. Thanks for sharing! That tricky treat ball looks like a great one. My dog, Glia, loves the treat toys that she can roll around. Thanks for the suggestion. I always buy my niece’s dog a Christmas present. I think this year I”ll buy him the treat ball. And maybe I”ll get my niece the PetChatz while I”m at it. Gusto needs the iFetch toy even while I am home! That sounds like a wonderful toy. I have found that Gusto likes to work for his food rather than just eating it out of a bowl. My friend’s Dachshund will use the iFetch toy until she drops, then rest and start up again. Super tips! And with Huskies, who can get bored easily if they are not “working” – these are some of my go-to’s! I actually have a video cam to install! (Kind of excited about that)! My dogs love those puzzles and Kongs (filled with peanut butter and frozen, yum-mee)! Pinning your post to share! Thanks so much, Dorothy! Your five sibes must keep you hopping all day long. I’d be excited about the video camera, too, but honestly it would mainly capture my senior dog and senior cat napping together. Another idea might be a twice a week dog walker visit? Get the pup into the fresh air a couple of times a week, it will really break up the day. I love your selection. We love our Petcube, it lets me keep an eye on the cats wherever they are on the network, we don’t do the chatting though it totally freaks them out LOL! My work schedule has recently changed and I am now home more with my pets. I think they are enjoying it very much! I do want to try one of the cameras eventually. Great tips and options! I have a few dog puzzles that I fill with treats that seem to keep the pups happy when I’m out of the house for longer than usual. I love the idea of the PetChatz, will have to look into one of those. Thanks for sharing! Nice post. I don’t have a dog however I understand mental stimulation and playtime is important. You gave great ideas and options for variety for pet parents. Kilo the Pug loves treat balls and puzzles and stuffed frozen Kongs whether I am home or not. It’s so important to keep dogs mentally and physically exercised. I love my camera monitor too.